An instant rebate of $100 per speaker has been applied to the regular sale price! Price shown reflects price after rebate. Offer valid through April 30. When not just any speakers will do, turn to super speakers that seem to do it all. JBL EON615 powered speakers are portable powerhouses in their own right, offering Class D amplification for 1000 watts peak power, JBL's advanced waveguide technology for smooth dispersion, impressively high SPLs, and Bluetooth for wireless control of DSP EQ settings. 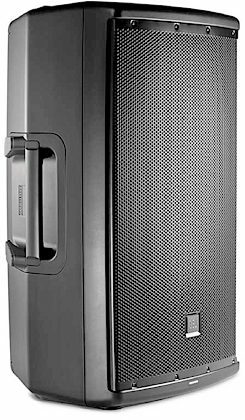 JBL's EON series of powered speakers have long been a noteworthy value in portable PA systems, and the redesigned EON615 takes the series up another notch! This versatile, self-powered, two-way, bass-reflex speaker system offers a 15-inch woofer, letting you blast that bass without breaking a sweat. 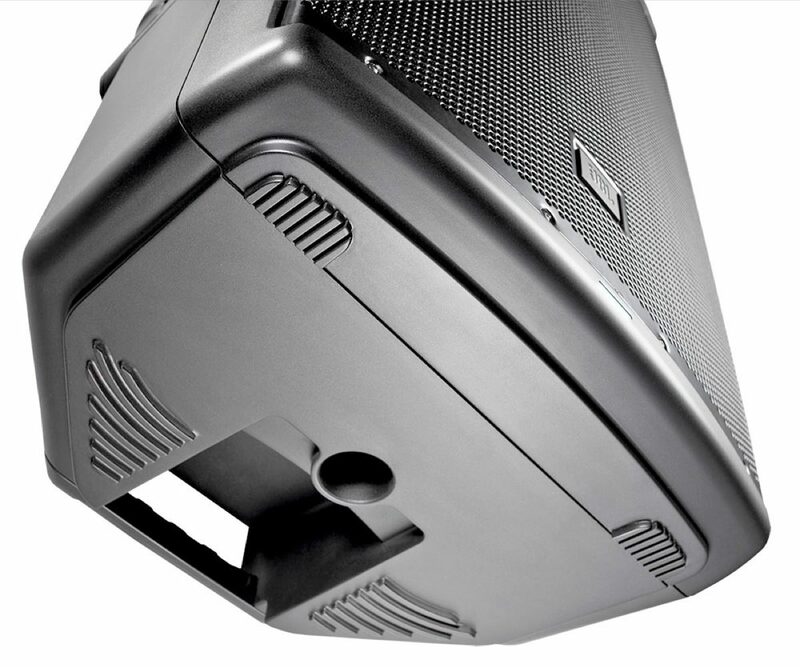 Able to support any show, the EON615 outputs 1000W peak power with high SPLs up to 127 dB. For critical live sound applications or your basement practice space, this set of powered speakers delivers transparent, high-volume power and consistent coverage for full-spectrum sound across all genres. 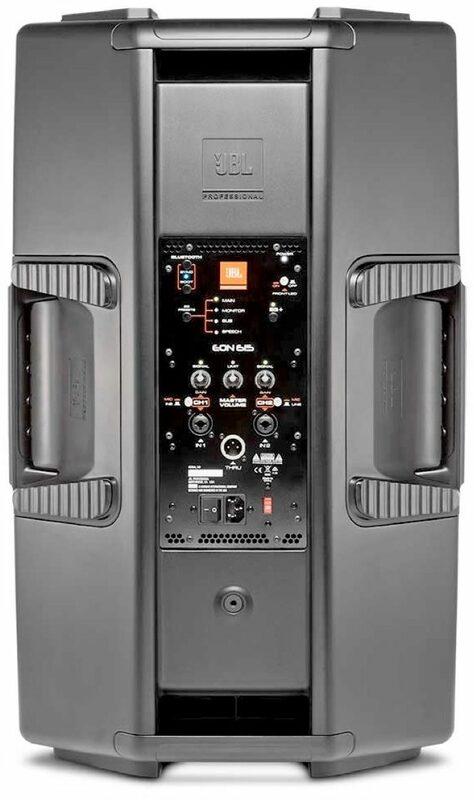 Its Class-D amplifier design keeps the overall unit relatively lightweight and compact, while well-placed handles help you carry the EON615 from van to venue. 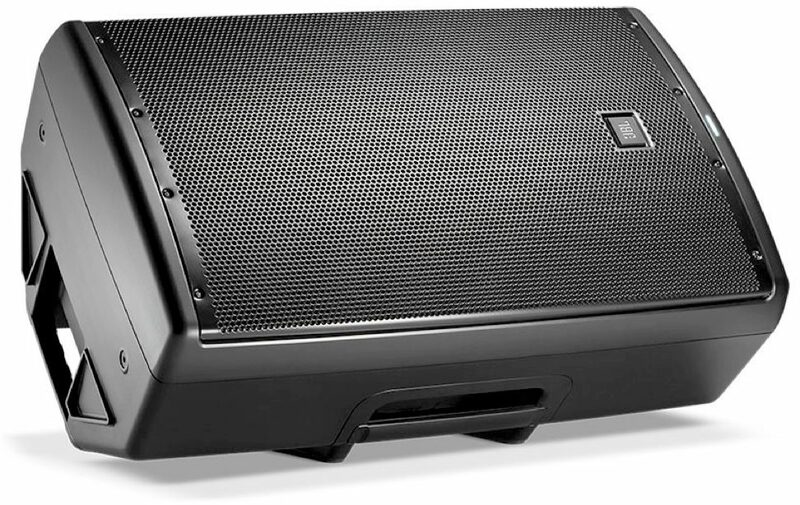 Indexed feet molded into the enclosure provide welcome security when stacking multiple units on stage. And when stage space is seriously tight, integrated hardware mounts let you fly the speakers. 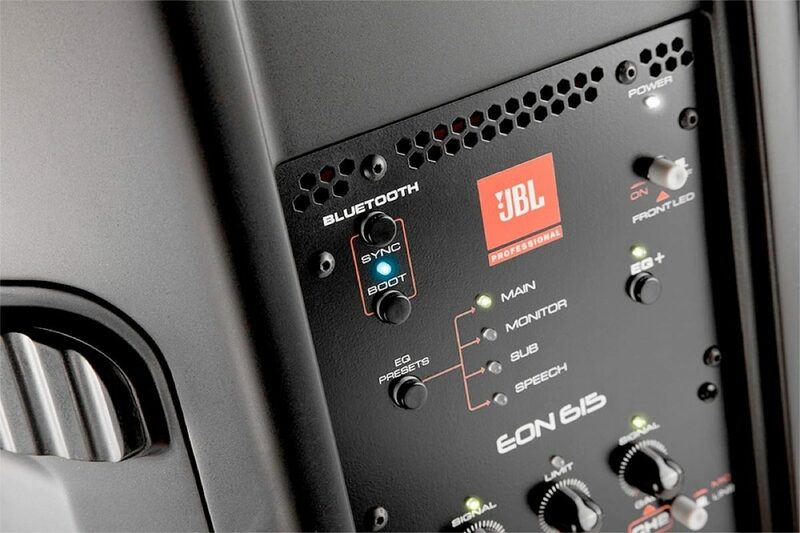 The EON615's DSP EQ parameters may be selected and adjusted via the speaker's back panel or from your mobile phone or tablet via Bluetooth. If the sound check doesn't catch everything and you need to tweak your tone mid-performance, you can do it from afar without interrupting the show. Conveniently, the speaker system's Bluetooth interface supports both iOS and Android devices. NOTE: Bluetooth audio streaming is not supported. Easy to transport and set up, JBL EON615 powered speakers provide high-end, high-power sound for a range of applications. 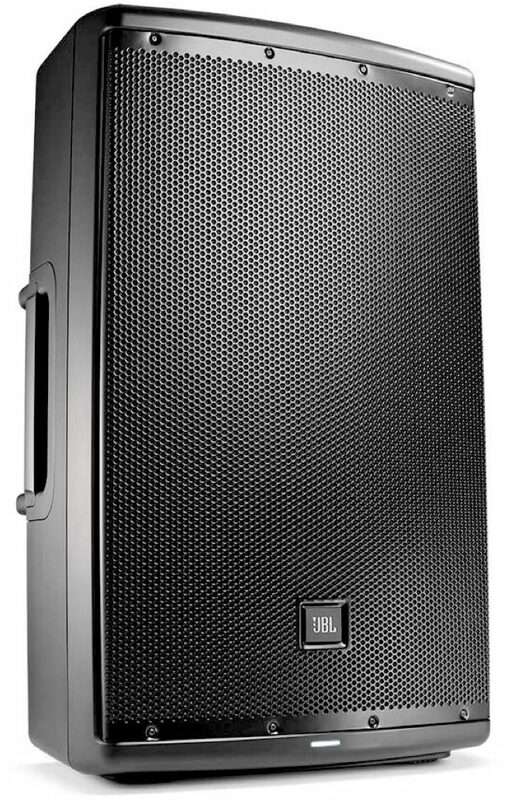 More than just another great JBL sound system, the JBL EON615 is a true step forward in technology developed specifically to deliver the best sound possible regardless of its application. Completely rethinking how truly good an affordable self-contained, portable PA system can be, JBL engineers purposely designed and built the EON615 from the ground up featuring JBL's advanced waveguide technology, JBL designed and manufactured transducers, and convenient, wireless remote control of its onboard DSP EQ parameters via Bluetooth. This total redesign of the EON platform leverages advanced technologies in cabinet materials, acoustic science, transducer design and user friendliness that delivers the extraordinary quality of a high-end studio monitor in a fully professional, highly flexible, easy to use, portable system for today's working musicians and sound providers. 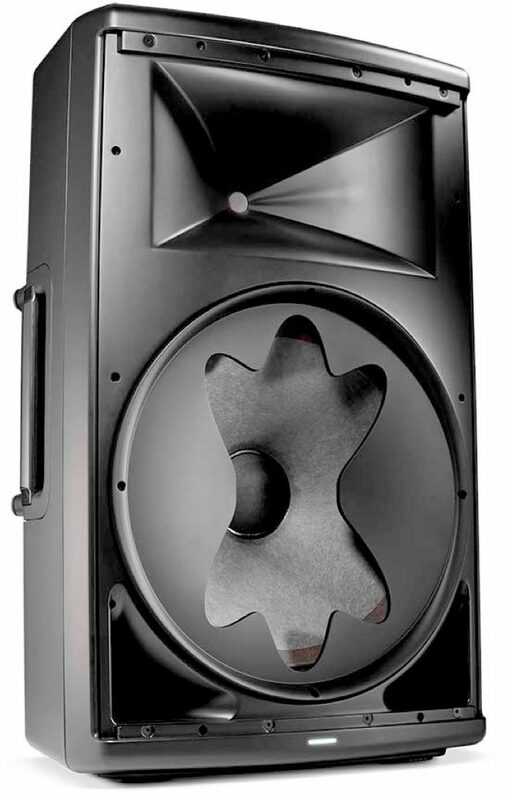 "I've loved JBL Eon Speakers...now love the EON 615s"
Overall: I've had old JBL EON G2 15" speakers for years. I wanted to upgrade and am still pleased with the EON line. I like the handles on the 615s and the lighter weight. These have been rock solid at the DJ events where I've performed. My only let-down is the fact that the Bluetooth is not for connecting to a bluetooth device, as I had hoped. I thought I would be able to bluetooth link my iPad, so I could use a speaker to play music from my tablet. Apparently JBL has that only for linking their still-not-yet-ready i-device app. 44 of 45 people (97.78%) found this review helpful. Did you? "Loud and clear, could use some additional bass"
Overall: Like anything JBL, you get pretty amazing sound even on these entry level PA speakers. There are obviously cheaper choices in the market but I've listened to some of those in store and they can't hold a candle to these. As others have stated you have to get the gain up to 3 o'clock before it starts getting some serious power. I've only set these up in the house but I got them as loud as we could handle and I didn't hear a lick of distortion. It did seem to be lacking on the low end a little bit. I'm wondering if that weird baffle has anything to do with it. It seems to be there in order to keep the sound radius at 90 degrees. The sound had full range but if you're going to be doing electronic, hip/hop, etc... you're probably going to want to pair these with at least one subwoofer to get the low end you're looking for. All in all I'm pleased with the purchase. Bluetooth app is out now and haven't messed with it much but was able to get it to work no problem....Oh and a BIG thing to know with the app: If you can't connect to the speaker you need to turn the speaker off, hold the Boot and EQ+ buttons down and turn the speaker back on. Wait until all the buttons finish flashing (they'll all do it at once several times) and then you should be able to connect no problem. It was a beast trying to find that information. Hope this helps! 61 of 63 people (96.83%) found this review helpful. Did you?